Terraria - one of the most popular games for Android, made in the genre of "sandbox". The toy is somewhat similar to the famous Minecraft, but it was developed by completely different people. At the same time, Terraria has several advantages. It should be noted that the graphics of the game are much nicer than those of a competitor, despite the fact that it is made in 2D. Note that the new version requires 1 GB of RAM. Otherwise, the performance of the game will fall sharply. At the same time, lack of memory causes a ban on the creation of an expanded world. Thanks to the network connection, you can play with friends. In order for the smartphone to always have the latest version of the game, you need an internet connection for timely updates. Without access to the global network, the game simply will not start. Terraria on Android is similar to Minecraft, but differs in that it has only one “survival” mode. Compared to competitors, construction does not play such an important role. Terraria is fundamentally different worked graphics. As a result, it becomes easier to find ore and “treasures”, and the traps hidden in the ground will not be a surprise, as they are easily visible. All tools are made of metal such as copper. Over time, the tool is improved, there is also the possibility of creating new tools. With the help of an ax you can chop wood, and pick up ore with a pickaxe and dig the ground. The blade is necessary for defense and attack. 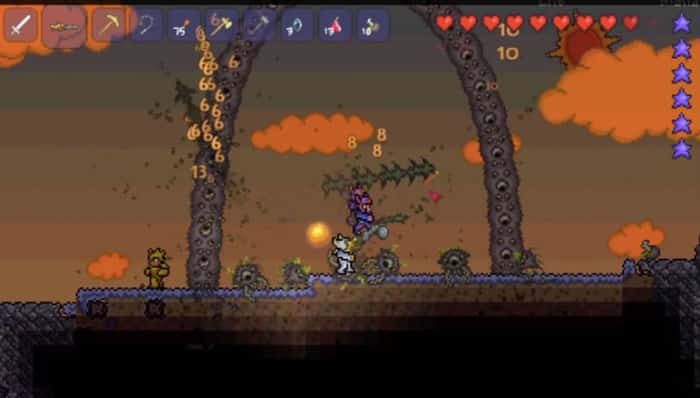 The game Terraria, installed on Android, is built in such a way that at the beginning of the way, the character was attacked by monsters. This means that you have to survive from the first minutes of the game process. It should be noted that killing monsters can be a blade, and other tools, but it will take more time. From killed animals fall out of various kinds of objects. In the future, they will need to pass the game. Terraria on Android has a unique battle system, which is worked out much better than in Minecraft. Aggressive mobs will not be so easy to kill, so you have to try hard. Each location will delight you with its fauna and flora. The game is notable for the fact that you do not need to constantly equip your world. You will have the opportunity to pump the character. You can strengthen the hero with the help of equipment. The game also contains artifacts, but to create them will require rare resources. Even avid skeptics will appreciate the game and realize that this is not a clone of the famous Minecraft. Of course, this does not mean that there are no flaws in the game world, but they are minor. Support for the Russian-language interface. In addition to the above features, you can highlight the quality 2D graphics, as well as a constant update. Having considered all the subtleties of the game world, it remains only to start the game, but before that you should understand how to download Terraria on Android. It is more convenient for one user to download applications directly from Google Pleya, while for others, it’s via Internet resources. It is important to consider that the application is installed on the internal memory of the phone. Owners of smartphones full version of the game can be downloaded from the Play Store. First, you need to run Google Play on your device. As soon as the application starts, you need to enter "Terraria" in the search bar. After a second, the search result appears. You can choose the paid and free version of the product. In the editorial Free there is advertising and some restrictions. Those who want to fully enjoy the gameplay should purchase the paid version. Having defined the editors, you will need to click on the “Install” button. Then the automatic installation of the product will begin. To fully download the game you need 2-3 minutes. It all depends on the speed of the Internet. Once the toy is installed, you can start the game. Do not forget that in the world there is paid content. To go to the download page, click on the “buy” menu item, and then click on the “Android” graphic link. You will be redirected to the page with the application in Google Play. You just have to click on the "Install" button. The installation of the game takes 1-2 minutes. If you have any questions about the game, you can visit the forum posted on the website or use the help. 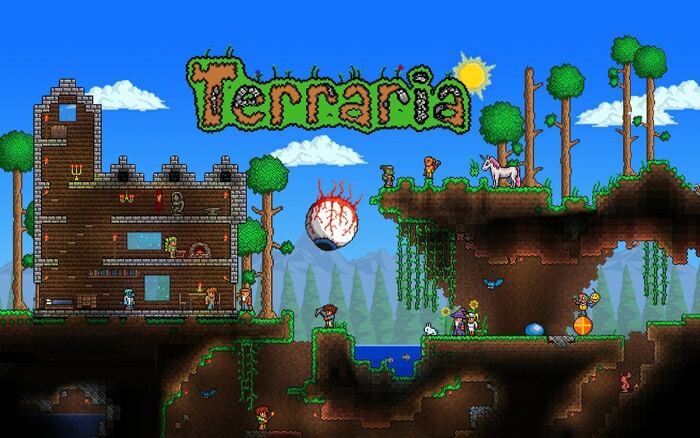 If you like sandbox games, Terraria will surely please you. This world is different from the usual Minecraft. The goal of the game is not easy construction, but survival. Gameplay delays from the first minute. Unfortunately, there is an advertisement in the free version of the product. You can disable it only after purchasing the paid version.